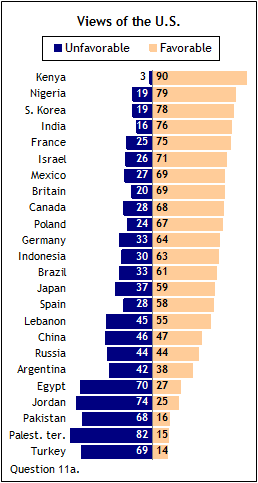 Attitudes toward the United States have become more positive in many nations across the globe over the last year. The shift in public opinion has been especially strong in Western Europe, but can be seen elsewhere as well, including Latin America, Asia, Africa, and to a lesser extent, the Middle East. In some nations, positive ratings of the U.S. are back to where they were at the beginning of the decade, before plummeting during the early years of the Bush Administration. Clearly, the rise in U.S. favorability is associated with views of the new president, and dramatic changes on a number of measures illustrate the degree to which the nations around the world see America differently with the advent of a new administration (see Chapter 2 for views of President Obama and his presidency). Consistently, both the United States and the American people receive higher ratings than they have in recent years. Fewer now see the U.S. acting unilaterally in world affairs. And support for America’s anti-terrorism efforts has increased substantially. Still, there are reservations about the U.S., especially about how it uses its military might. Most publics want American and NATO forces out of Afghanistan. Few are optimistic about Iraq. In Muslim nations, many still worry about a potential military threat from the U.S. The worldwide economic crisis also continues to present challenges for America’s image. Even though the U.S. tends to receive more positive reviews for its handling of the crisis than either the EU or China, many still believe the American economy is having a negative impact on the rest of the world. 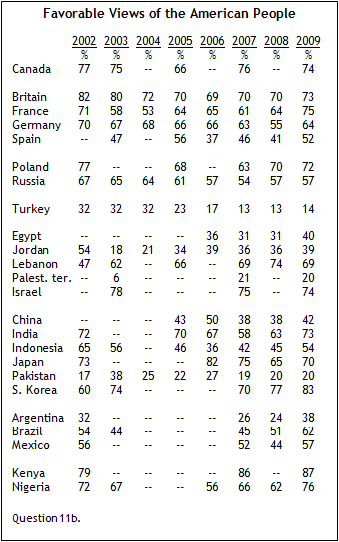 Majorities express a very or somewhat favorable view of the United States in 16 of 24 countries. In 10 nations, at least two-thirds say they have a favorable view. This represents a dramatic shift from recent years. Indeed, since last year, positive views of the U.S. have become more common in 16 of the 20 countries where trends are available, while remaining about the same in four nations. Many of the increases are striking, especially among some of America’s traditional Western allies. Last year, only 42% expressed a positive opinion of the U.S. in France; today, three-in-four feel this way. Just 31% of Germans held a favorable view last year, compared with 64% now. Large increases also took place in Spain (+25 percentage points) and Britain (+16). More than two-thirds (68%) of Canadians have a positive opinion of the U.S., up from 55% in 2007, the most recent year in which Canada was surveyed by the Pew Global Attitudes Project. Opinions of the U.S. remained largely unchanged in the two Eastern European countries included on the survey. Poles (67% favorable) continue to hold overwhelmingly favorable views, while Russians continue to be divided – 44% give a favorable rating and 44% an unfavorable one. The image of the U.S. has also improved significantly in Latin America, with double-digit increases not only in Mexico (+22) and Brazil (+14), but even in Argentina (+16), where negative attitudes toward the U.S. have prevailed at least since Argentina’s economic collapse at the beginning of this decade. In Asia, ratings of the U.S. have improved in India (+10) and South Korea (+8), where attitudes were already largely positive, as well as in Japan (+9) and China (+9), where views were more lukewarm. However, the largest change in Asia has taken place in Indonesia (+26), where President Obama lived for several years as a child. The exception in Asia is Pakistan, where opinions remain largely negative and unchanged (19% favorable in 2008, 16% in 2009). Similarly, attitudes are stable but negative among two other predominantly Muslim publics: the Palestinian territories and Turkey. Palestinian views of the U.S. (15% favorable) show little change from 2007 (13%), although the current ratings are higher than in 2003, when less than 1% of Palestinians voiced a favorable opinion of the U.S. Despite a visit from President Barack Obama and considerable diplomatic outreach over the last year, only 14% of Turks express a positive view, the lowest of any nation surveyed. Turkey also gave the U.S. its lowest marks among the nations surveyed by the Pew Global Attitudes Project in 2008 and 2007. Favorability ratings for the U.S. have increased slightly in Jordan (+6), Egypt (+5), and Lebanon (+4), although positive views have declined in America’s closet ally in the Middle East: Israel. While 71% of Israelis continue to express a positive opinion of the U.S., this is down from 78% the last time Israel was surveyed in 2007. The U.S. has been popular throughout much of sub-Saharan Africa in recent years, and it receives high marks in the two African countries included in this year’s survey. Approximately eight-in-ten (79%) Nigerians have a positive opinion, up significantly from last year’s already high 64%. As was the case in 2007, Kenyans overwhelmingly see the U.S. in a positive light – nine-in-ten express a favorable view in the homeland of Barack Obama’s father. Views of the U.S. have improved in several of the Muslim publics included in the study, although Indonesia and Nigeria are the only two nations in which a majority of Muslims express a positive opinion. In Nigeria, the gap between Muslims and Christians has narrowed slightly. Last year 39% of Muslims held a positive view of the U.S. compared with 89% of Christians. This year, 61% of Muslims have a favorable view, compared with an extraordinary 96% of Christians. Within Lebanon’s Muslim community, perceptions of the U.S. are extremely polarized along religious lines. Only 2% of Lebanese Shia express a positive attitude toward the U.S., barely an improvement from last year’s 0%. But a remarkably high 90% of Lebanese Sunni hold a positive view of the U.S., up from 62% in 2008. Sunnis now have more favorable views of the U.S. than the country’s Christian population – 66% of Lebanese Christians express a positive opinion of the U.S., down from 75% in 2008. Despite increases in favorable ratings of the U.S. in some Muslim nations, the perception remains widespread among many Muslims that the U.S. could pose a military threat to their country someday. Majorities in six of the seven majority Muslim nations where this question was asked say they are very or somewhat worried that the U.S. could become a military threat to their country. The only exception is Jordan, although even about half (48%) of Jordanians are very or somewhat concerned. Fears about a potential military threat have eased somewhat in four nations since 2007. The percentage of Turks saying they are very or somewhat worried has declined by 22 percentage points, although 54% in this longtime NATO ally of the United States still see the American military as a potential threat. Double digit declines have also take place in Jordan (-19) and Egypt (-13), and the percentage of Indonesians who are concerned about a potential threat is also down (-7). The highest level of concern is in a country currently at the center of debates about American national security: Pakistan. Roughly eight-in-ten (79%) Pakistanis say they are very or somewhat worried, up seven points from 2007. The American people receive largely positive ratings in this survey, with majorities saying they have a favorable view of Americans in 17 of 24 nations. There have been double digit increases in the percentage of people offering favorable views of Americans in seven countries: Argentina (+14), Nigeria (+14), Mexico (+13), France (+11), Brazil (+11), Spain (+11) and India (+10). However, the favorability rating for Americans generally has not increased as much as the favorability rating for the United States. In fact, the gap consistently identified in previous Pew Global Attitudes surveys – publics holding more positive views of Americans than of the U.S. – has disappeared in some countries, particularly in Western Europe. For instance, a year ago a 22-percentage-point gap was seen between the favorability rating for Americans (64%) and the rating for the U.S. (42%) in France; this year there is no gap, with 75% giving Americans and 75% giving the U.S. a positive rating. Last year, Spanish respondents were more likely to give the American people (41%) a favorable rating than the U.S. (33%), however Americans (52%) now receive a somewhat lower rating than their country (58%). The worst ratings for the American people are in three mostly Muslim nations: Turkey (14%), Pakistan (20%) and the Palestinian territories (20%). In all three nations, attitudes towards Americans have shown little change in recent years. In 18 countries, not including Western Europe, Canada or South Korea respondents were asked whether they think of the U.S. as a partner of their country, an enemy of their country or neither. The only two publics in which majorities consider the U.S. an enemy are the Palestinian territories (77%) and Pakistan (64%), although at least one-quarter of those surveyed call the U.S. an enemy in Turkey, Lebanon, Jordan, Egypt and Argentina. At least eight-in-ten describe the U.S. as a partner in Kenya, Israel and Nigeria, and majorities say this in Japan, Mexico, Brazil, India and Poland. In several countries, people are more likely this year to consider the U.S. a partner. Nearly six-in-ten (59%) Brazilians now say the U.S. is a partner of their country, compared with 34% a year ago. Almost half (47%) of Indonesians rate the U.S. as a partner now, compared with 23% last year. Increases have also taken place in Mexico, India, Argentina, Nigeria, Poland, Lebanon and Turkey. Although relatively few Turks (18%) describe the U.S. as a partner, this is nonetheless a significant increase from 2008, when only 8% held this view. More notably, while 70% of Turks characterized the U.S. as an enemy last year, only 40% do so today. Since 2007, fewer people in a number of nations have come to believe the U.S. acts unilaterally in world affairs. Among the 25 nations surveyed in both 2007 and 2009, the perception that the U.S. takes into account the interests of other countries has increased in 12 nations, decreased in four, and stayed about the same in nine. Increases have been especially strong among some of America’s key Western allies. In 2007, only 27% of Germans felt that the U.S. took into account the interests of countries like theirs a great deal or a fair amount when making foreign policy decisions, while 54% now hold this view. Only 11% of the French surveyed in 2007 believed the U.S. considered their interests in foreign policy, compared with 34% today. Large increases have also taken place in Britain and Canada. One exception to this pattern is Spain, where views have remained largely unchanged. Outside of the West, double-digit gains in the percentage of people saying the U.S. considers their nation’s interests have also taken place in South Korea, China, India and Russia. There is no predominantly Muslim nation in which a majority believes the U.S. considers its interests, although 44% of Indonesians express this view. In Pakistan, Lebanon, Egypt, Jordan, the Palestinian territories and Turkey, however, fewer than one-in-four take this position. 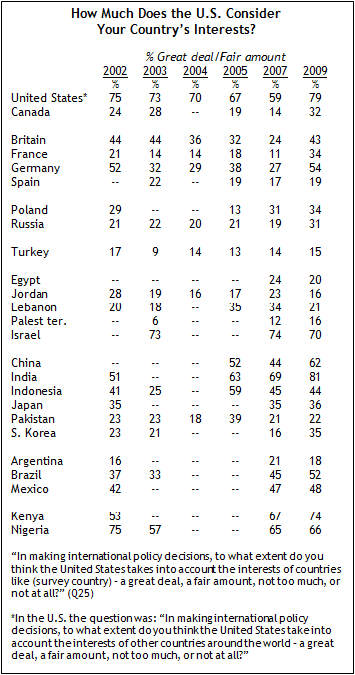 Moreover, Egyptians, Jordanians, and Lebanese are even less likely to believe the U.S. takes their interest into account than they were in 2007. American anti-terrorism efforts are now seen in a much more favorable light than they were in the last years of the Bush Administration. Looking at the 25 nations surveyed in 2007 and 2009, majorities in only five countries said they favored U.S.-led efforts to fight terrorism two years ago; today majorities in 15 nations take this view. Increases in support for U.S.-led anti-terrorism efforts have been substantial in many countries, such as Spain (+38 percentage points), India (+33), France (+31), Indonesia (+27), Germany (+26), Britain (+26), Mexico (+25), China (+24) and Canada (+22). In Britain, France, and Germany, support for U.S.-led anti-terrorism efforts is now close to where it was in 2002, shortly after the September 11 attacks. However, support remains low in some nations, including several that are key to the struggle against terrorism. In Pakistan, where government troops are currently battling the Taliban, and American drone strikes are targeting al Qaeda leaders, only 24% say they favor U.S.-led anti-terrorism efforts. Still, this does represent an 11-percentage-point increase from 2007. Fewer than one-in-five Egyptians (19%) or Jordanians (11%) support the U.S. anti-terrorism campaign, and in both countries support has waned somewhat since 2007. Although it has risen slightly, support for these U.S.-led efforts remains low in the Palestinian territories (10% favor). Majorities in most countries believe their country should take more responsibility in combating terrorism around the world. In India, home to Mumbai, where terrorists killed more than 150 people in late November 2008, 91% say they favor India assuming more responsibility to fight terrorism. More than seven-in-ten endorse the idea of greater responsibility in Spain (77%), Indonesia (76%), China (71%), Kenya (71%) and France (71%), and more than six-in-ten do so in Israel (64%) and Russia (62%). In Pakistan, which has been struck repeatedly by terrorist attacks in the last year, public opinion leans heavily toward greater responsibility – 50% favor more responsibility, while just 29% oppose and 22% offer no opinion. In several countries, however, there is less enthusiasm for taking on more responsibility. Most Poles (55%), Jordanians (57%), Lebanese (62%), Argentines (62%), Palestinians (68%) and South Koreans (72%) oppose an expanded role for their nation in these efforts. The war in Afghanistan is unpopular in most of the nations included in the survey. Majorities or pluralities in 18 of 25 countries say the United States and NATO should remove their troops from Afghanistan as soon as possible. In seven nations, majorities or pluralities want the U.S. and NATO to keep troops there until the situation has stabilized. Support for keeping forces in Afghanistan is highest in Israel (59%) and the United States (57%), as well as Kenya (56%). Support for withdrawal is especially common in majority-Muslim nations, such as the Palestinian territories (90%), Jordan (86%), Egypt (70%), Lebanon (68%) and Indonesia (66%). Slightly more than seven-in-ten (72%) support withdrawal in Pakistan, which shares a border with Afghanistan, and like Afghanistan, is dealing with instability caused by the Taliban and other extremist groups. However, the war is unpopular in several non-Muslim nations as well, including China (70% remove troops) and Russia (66%), as well as the Latin American nations of Argentina (77%), Brazil (56%) and Mexico (51%). Despite President Obama’s requests for additional troops from NATO allies, publics in NATO countries remain either divided or decidedly against keeping more forces in Afghanistan. Opinions are almost evenly divided in Spain, Germany, and France, although support for keeping troops in Afghanistan has increased slightly in all three nations since last year. The British remain split over this issue, with little change there since the 2008 survey. Meanwhile, the military efforts in Afghanistan remain overwhelmingly unpopular among NATO allies Poland and Turkey, even though support has inched up in both countries since 2008. Overall, the publics surveyed are skeptical about the political future of Iraq. Majorities in only six nations believe that efforts to establish a stable government in Iraq will definitely or probably succeed. Americans are divided on this issue, with 49% saying efforts to set up a stable government will succeed and 47% saying they will fail. The British are more optimistic than most publics about the prospects for Iraq. Even though over time the Iraq war became unpopular in Britain and took a heavy political toll on former Prime Minister Tony Blair, 51% now say these efforts will succeed, while 42% say they will fail. The German (31% succeed), Spanish (33%) and Canadian (28%) publics are much less optimistic. The French are divided on this issue, although public opinion leans slightly toward predicting failure (47% succeed, 53% fail). In Poland, a nation that once had more than 2,000 troops on the ground in Iraq, only 35% believe a stable government will be established there. While on balance, the Middle Eastern publics surveyed forecast failure in Iraq, substantial numbers predict success. In Jordan, which shares a border with Iraq, opinions are divided – 50% envision success, 49% failure. Among Lebanese there is a five-point gap between those who predict success (45%) and those who predict failure (50%). In Egypt, the Palestinian territories and Israel, slim majorities think these efforts will fail, while about four-in-ten think they will succeed. In another of Iraq’s neighbor’s, Turkey, there is little optimism. Only 17% of Turks forecast success in Iraq, the lowest percentage among the 25 nations in the study. Some commentators have viewed the current economic crisis as evidence that the world may be moving toward an era in which the United States no longer dominates the global economy, but publics in regions around the globe still tend to see the United States as the dominant economic power. Majorities or pluralities in 20 of 25 nations name the U.S. as the world’s economic leader. Majorities or pluralities in three nations put China in the top spot, while in one country (Germany) the EU is named the top power. Still, there has been a small change in perceptions of the global economic balance of power. 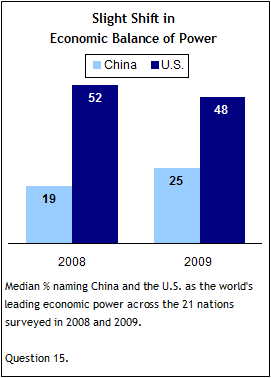 Among the 21 nations surveyed in both 2008 and 2009, the median percentage naming the U.S. as the world’s leading economy has slipped from 52% to 48%, while the median percentage naming China has grown slightly from 19% to 25%. In a sign that the Chinese people may believe the current crisis marks a shift in the economic balance of power, the percentage of Chinese who describe their country as the leading economic power has jumped 20 percentage points since last year, when only 21% characterized their country this way. Now Chinese public opinion is evenly divided – 41% name the U.S. and 41% name China. However, the view that the U.S. is the foremost economic power in the world remains common, both in countries like South Korea (80% U.S.) and India (63%), where the U.S. is overwhelmingly popular, and in countries such as Turkey (58%) and Egypt (55%), where the U.S. receives less favorable ratings. And even though Chinese investment in Africa and Latin America has grown significantly in recent years, the U.S. is still considered the dominant economic power by all the African and Latin American publics included in the survey. The two nations that share a border with the U.S. – and the two nations that are partners with the U.S. in the North American Free Trade Agreement – have very different views on this issue. Mexicans overwhelmingly name their northern neighbor as the world’s leading economy – 55% say the U.S. – while China comes in a distant second at 16%. Canadians, on the other hand, no longer see a world in which the U.S. plays the preeminent economic role; instead, 37% choose China, while 35% say the U.S.
China also leads the pack in Russia, where at 17%, the U.S. actually comes in third place behind China (26%) and Japan (22%). Since last year, the percentage of Russians who see China in the top spot has risen 14 percentage points. Americans have also become somewhat more likely to believe China occupies the top position – 33% now feel this way, compared with 26% in 2008. Still, 48% of Americans name their own country as the leading economic power, basically unchanged from last year (46%). In the Middle East, more Lebanese have come to see China in the top position this year (32% versus 22% in 2008). By a slim three-point margin, Lebanese respondents are more likely to identify China as the world’s leading economy more often than the U.S. But elsewhere in the region – Egypt, Jordan, the Palestinian territories and Israel – the U.S. is still considered the strongest economic power. And in Jordan (+13) and Egypt (+12) the share of the public naming the U.S. has increased significantly. There is a consensus among the publics surveyed that the U.S. exerts a strong influence in their countries. In all 24 nations outside the United States, majorities say the U.S. has a great deal or fair amount of influence on the way things are going in their country. In 10 nations, more than three-quarters take this view. Interestingly, the country where this view is least common is Pakistan, which has been the focus of considerable attention from the American government in recent months. More than half (55%) of Pakistanis say the U.S. influences their country a great deal or fair amount, a slight decrease from last year, when 59% held this opinion. Perceptions of U.S. influence are also down by double digits in Turkey (-21 percentage points), Jordan (-15), Egypt (-12), and France (-10). On the other hand, the U.S. is seen as having a greater impact in China (+15) and India (+12). Even though America’s overall image has improved in the last year, its influence in countries around the world is still seen more often as negative than positive. This is especially true in several Muslim-majority nations, including the Palestinian territories (70% negative), Jordan (53%) and Lebanon (48%). Argentines (48%) also tend to say the U.S. has a negative impact on their country. Conversely, Kenyans (52%), Indians (51%), and Nigerians (43%) are more likely to see American influence in a positive light. Perceptions of America’s economic reach resemble views of America’s overall influence: Majorities in every nation surveyed say that what happens in the U.S. economy affects economic conditions in their country a great deal or fair amount. On balance, publics are much more likely to believe the U.S. is having a negative impact on their economy than a positive one. The most negative views can be found in the country that is America’s largest trading partner – 78% of Canadians say the U.S. is having a negative impact on the Canadian economy, while 12% say it is positive, and 5% say that the U.S. has no influence or has a mixed influence. Nearly three-quarters consider the U.S. a negative economic influence in another major trading partner of the U.S.: Germany. Fully 72% of Germans say the American economy is having a negative effect. More than six-in-ten believe the U.S. is negatively affecting their national economies in the Palestinian territories (68%), Japan (67%), France (63%), Israel (63%) and Britain (62%), and at least half take this view in Mexico (58%), Turkey (55%), Argentina (55%), Jordan (52%) and Russia (50%). But views are not overwhelmingly negative everywhere. South Koreans (37% negative, 35% positive), Chinese (27% negative, 26% positive) and Indonesians (27% negative, 28% positive) are divided on this issue. And a solid majority (55%) of Indians think the U.S. is having a good impact on the Indian economy, which has grown considerably in recent years and continues to grow even during the economic downturn, albeit at a more modest rate. As the global recession has progressed over the last year, many publics have become more likely to believe economic conditions in the U.S. are having a negative impact in their own countries. Half of Russians characterize America’s economic influence as negative, whereas only 31% felt this way last year. Nigerians are now much more likely to say the U.S. is having a bad impact (46%) than they were in 2008 (18%). Negative perceptions have also become more common in Poland (+13), Pakistan (+10), Mexico (+9) and China (+9). 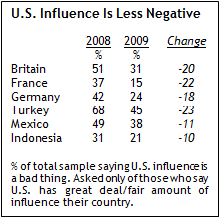 However, in several nations, people have become less likely to describe American economic influence as negative. Seven-in-ten Turks felt this way last year; today, 55% hold this view. Double-digit declines have also taken place in Britain (-10) and Indonesia (-10). Overall, there is little consensus regarding which of the major powers is doing the best job of dealing with the worldwide economic crisis, although the U.S. generally gets higher marks than China and the EU. When asked who is taking the best approach to fixing the crisis, in most countries surveyed people are more likely to choose the U.S. than the EU or China. The American approach is favored over the EU’s or China’s in the U.S. (60%) and Canada (39%), as well as in all of the Latin American and African nations included in the survey. However, in Argentina and Mexico more than one-third either do not have an opinion or say that none of these countries is taking the best approach. Four major Asian nations favor the American approach: India (62%), South Korea (57%), Indonesia (49%) and Japan (30%). 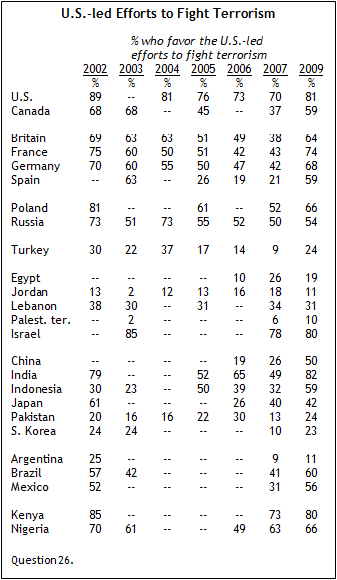 Israelis (55%), Egyptians (45%), and Jordanians (43%) also tend to believe the U.S. is doing the best job on this issue. The EU is named most often in six nations, including all five EU member states in the survey – Germany (68%), France (63%), Britain (44%), Spain (39%) and Poland (38%). Palestinians also identify the EU (38%) more often than China (25%) or the U.S. (21%). The Chinese overwhelmingly believe their own country is doing the best job of dealing with the crisis – 60% say China, far more than either the U.S. (20%) or the EU (8%). China is also the top pick in Lebanon (36%), Pakistan (36%) and Russia (27%).